Serving your country is one of the most selfless and demanding careers that any American can pledge their life to. 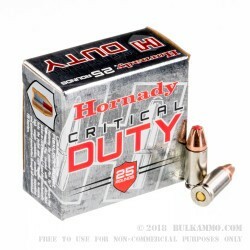 Hornady 135 grain 9mm Critical Duty Jacketed Hollow Point ammunition is engineered to serve those the who protect our freedoms, and is guaranteed to stop even the largest of threats dead in their tracks. Hornady 135 gr. 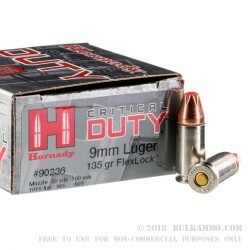 Critical Duty ammo was designed to work flawlessly during both daytime and low light environments. Precision measured low flash propellants will not rob you of your night vision or sight picture during extended courses of fire. Bright nickel-plated brass makes for easy chamber checks even during the darkest of conditions, and premium boxer style primers will burn hot in even the coldest of urban environments. 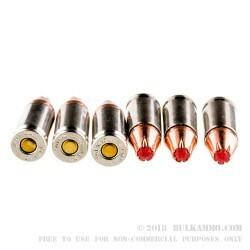 A solid copper jacket makes a hard hitting, deeply penetrating round that will not prematurely expanded before entering the terminal cavity, and at an average muzzle velocity of 1,100 feet per second, guaranteed to leave their mark on any target. 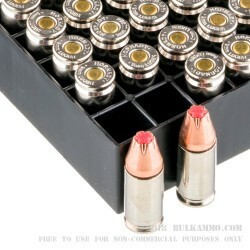 Professionals looking to shoot the best now have an answer, the Hornady 135gr 9mm Critical Duty JHP.